The third of a three-part series reviewing the history of apartment housing in Greensboro. By 1940, Greensboro was evolving from a small city to a regional industrial and insurance center by experiencing dramatic increase in population – surging from 10,035 in 1900 to 59,319 in 1940. In growing into the 3rd largest municipality in North Carolina there was a dramatic need for expanded housing opportunities, including large-scale apartment development. In the 1930s, new ideas were introduced to Greensboro apartment investors and planners in the form of Garden Apartments. This model of urban planning was expressed by British urban planner Sir Ebenezer Howard in his 1898 book, To-morrow: A Peaceful Path to Real Reform. He envisioned low-density cities that preserved natural green spaces by concentrating housing units into multi-family complexes, called “super blocks.” The super block/garden apartment movement grew popular in the United States as part of President Roosevelt’s New Deal program to redevelop urban areas. Superblocks were designed with curvilinear street patterns reflective of natural land forms. Buildings were arranged in a variety of angles to maximize privacy and to capitalize common areas and playgrounds. The whole was interconnected by walking paths, parking areas, and service drives. Erected in 1937, the Country Club Apartments (image, above) are the first “garden-style” apartment complex in the city. 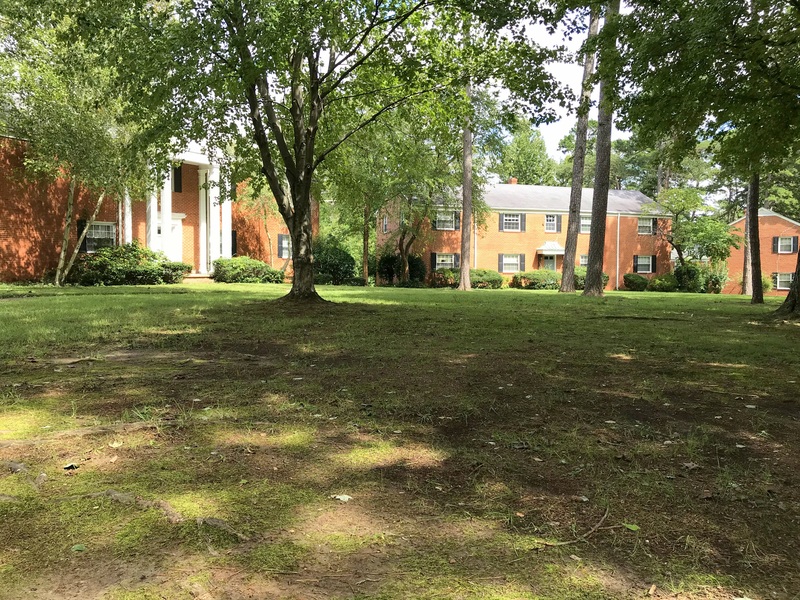 The complex is located at 1700 North Elm Street adjacent to Greensboro’s Irving Park subdivision and its Greensboro Country Club. Greensboro architect Charles C. Hartmann designed the community in the Colonial Revival idiom in a teardrop-shaped arrangement of two-story apartment buildings enclosing open space and surrounded by a service drive. The 86-unit complex features flat rooflines with three key structures highlighted with green gable roofs. Facades include white painted brick with implied quoins at building corners, dentil banding and cornices, steel casement windows, and balconies with delicate wrought ironwork. Windows and doors, particularly those on the ground floors or above entryways, are Neoclassically-inspired. Interiors are pragmatic and durable, with terrazzo tile corridors, tiled bathrooms, and kitchens equipped with metal cabinets, electric stoves, and electric refrigerators. The apartment complex was privately financed by investors Julian Price, then president of Jefferson Standard Life Insurance Company, and Emry Green, then president of Pilot Life Insurance Company to address a community housing shortage. The George W. Kane Construction Company erected the $525,000 project that was heralded as the “largest apartment house in North Carolina” at the time, and set the stage for a new generation of apartment design in Greensboro. 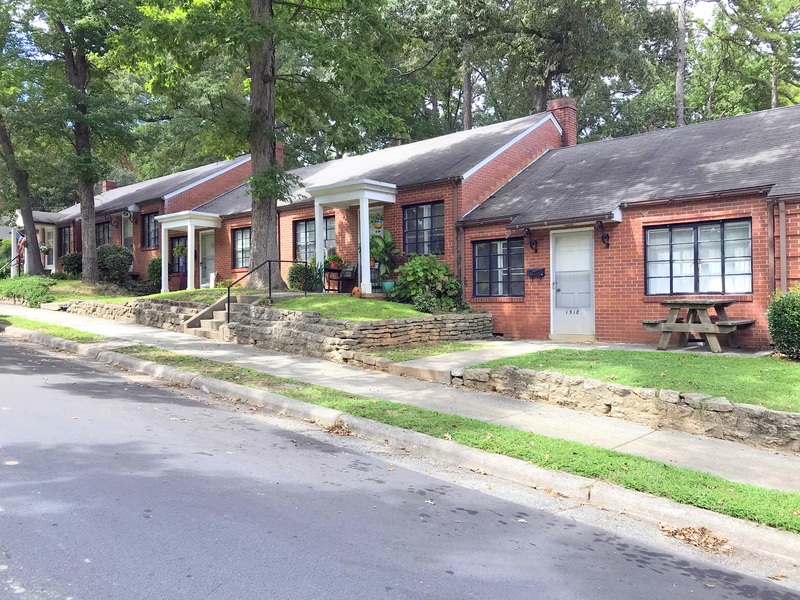 Announced in 1940, the Westover Terrace Apartments in the 1100 and 1200 blocks of Westover Terrace across from Grimsley High School are a relatively modest iteration of the garden-style mode. The $325,000 project complex was announced by Charlotte investors J. J. Harris and C. N. Whilden and was privately funded by the Prudential Insurance Company. Constructed by Blythe Brothers Company of Charlotte, the 100 “thoroughly modern and compact” apartments are divided among fourteen one-story brick buildings arranged in courtyards and feature details including both covered and exposed entry stoops and steel casement windows. Charles W. Connelly (1905-1967) of Charlotte was the project’s architect. Connally was commissioned to design country clubs at Quail Hollow, Myers Park, and Carmel in Charlotte, and Sardis Presbyterian Church there. In 1946, President Truman signed the Veteran Emergency Housing Act to provide favorable terms for loans used to construct large-scale rental housing projects to accommodate military personnel returning from duty. This fueled an unprecedented wave of large-scale apartment construction in the Gate City that was boosted by employment expansion in areas of chemicals and electronics. Player Realty Company of Fayetteville was perhaps the first to take advantage of this opportunity in the summer of 1947 when it announced plans for 16 four-unit apartment buildings on Open Whilden Place. The $500,000 Whilden Place Apartments were financed through the Brown-Hamel Mortgage Company with FHA mortgage insurance. 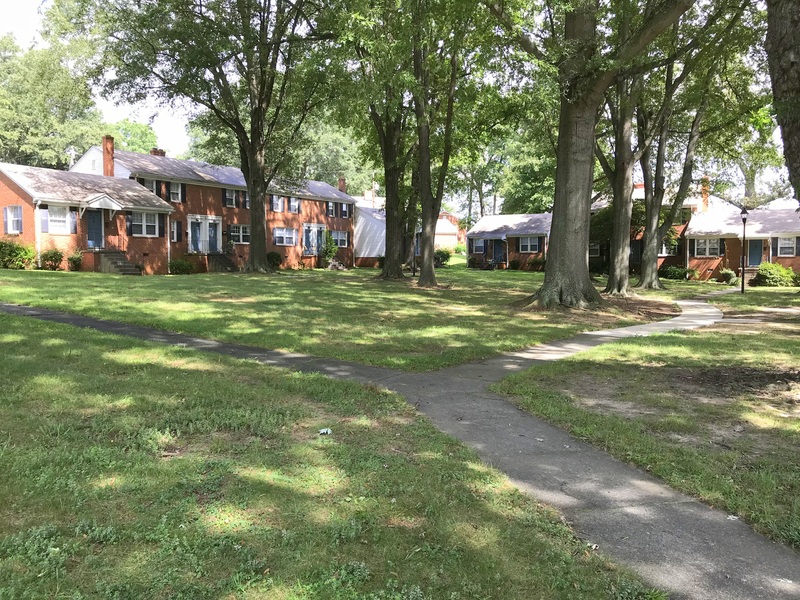 The complex is divided into groups of four living units, some facing the street and others facing open courtyards in a manner “somewhat similar to the Westover Terrace Apartments” according the Greensboro Record. The apartments were designed in the Colonial Revival-style with brick veneer, distinctive lattice wrought-iron porch supports, and dormer windows. Each apartment unit is composed of a living room, dinette, kitchen, bath, and two bedrooms. Durham architect Archie Royal Davis (1907-1980) was the project’s designer. He was also the designer of the Carolina Inn and the UNC Morehead Planetarium in Chapel Hill. The W. H. Weaver Construction Company was the first Greensboro-based company that specialized in apartment construction. The company was established by William Herman Weaver in 1939 as a single-family home builder, but began a specialization in multi-family properties in 1946. Weaver projects blended traditional Colonial Revival details with contemporary pragmatism. Architectural details are often discovered at entryways, where gabled roofs, entablatures, standing-seam copper roofs, or porticos, are the only reference Colonial antecedents on an otherwise austere modern facade. Latham Park Manor Apartments was the first substantial project for the company, begun in 1947. The community was the first of several large-scale apartment communities by Weaver Construction. 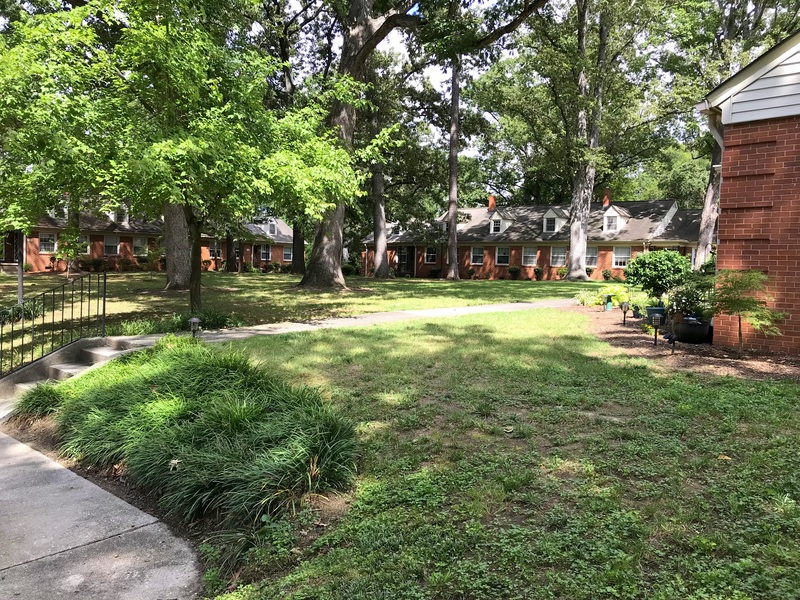 Located in the 900 and 1000 blocks of Hill Street adjacent to Latham Park, the 140-unit Latham Park Manor Apartments represented a $1,250,000 investment financed by Brown and Hamel Mortgage Company of Greensboro. The Greensboro Record described the 41-building project as “colonial architecture” and composed of one- and two-story gabled brick buildings arranged in courts. Four types of units composed the design including one-, two- and three-bedroom units on one and two levels. Each unit has a living room, dining alcove, kitchen, bath, forced-air heat and electric water heaters. 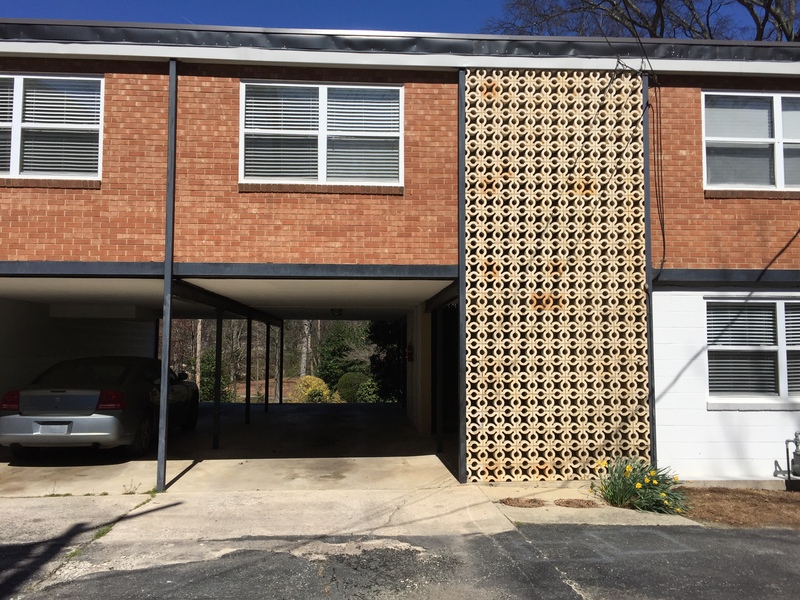 Robert J. Barbee (1927-2003), former chief architect for the Federal Housing Administration in North Carolina, was architect for the project. A North Carolina native, Barbee moved to Florida in 1958 were he is credited with designing the Punta Gorda Isles upscale waterfront community. Underscoring the importance of landscape to the garden apartment model, Weaver commissioned R. D. Tillson of High Point to design landscaping and J. Van Lindley Nurseries to install plantings. Paved walkways, drives, and service walks connect buildings to parking and play areas. Weaver Construction continued development of a series of large-scale apartment projects. In 1948 it broke ground on the Forest Grove Homes community near the intersection of Summit and Bessemer avenues, east of the Summit Shopping Center. The same year, Lindley Park Manor was announced for the 300 block of Ashland Drive. In 1951, Sunset Homes was built at 527 Open Overlook Street. All three projects were insured by the FHA. Forest Grove Homes was a 206-unit complex, making it the city’s largest to-date. The $1,431,00 project was financed by Security National Bank and focused on moderate-income tenants with monthly rental rates between $45 and $65 per month. The apartments were arranged among 68 one-story frame buildings with one-, two-, and three-bedroom options. The innovative project was erected by utilizing pre-manufactured modules from American Houses, Inc, of New York City. The community was recognized by the National Association of Homebuilders with a second-place national award. Lindley Park Manor was a 176-unit community that cost $1,487,084 to build. The project included 48 one-bedroom units that rented for $75 per month and 128 two-bedroom apartments that rented for $85. The complex is comprised of two-story gabled brick buildings arranged in arcs and crescents on the 16-acre campus overlooking Lindley Park. Each contains a living room, dining alcove, kitchen and bath, including heat, hot water, and janitorial service. Robert Barbee is attributed as the designer for the community. Sunset Homes was the next project by Weaver. Located at 527 Open Overlook Street the $375,000 campus consisted of 39 one-story gabled structures incorporating 167 apartments. The 16-acre campus is arranged with courts and crescents with utility access to the rear of three- and four-unit buildings. The design is the most austere of the Weaver projects, with a mix brick and frame apartment houses as a contemporary interpretation of Colonial architecture. Mark-Rand Corporation was another Greensboro-based developer of the period that had an important role in the development of apartments. Contractor Randall Sheppard destroyed the Penn Estate overlooking Fisher Park at 607 Church Street, and erected the Mark Rand Apartments in 1960. The $125,000 complex included 28 air-conditioned and electrically heated units. The project’s architect was Adrian Stout (1926-2007), and he took a decidedly different approach from the utilitarian apartment designs of the past two decades. The appearance of the structure is dramatic and bold, influenced by the work of architect Ludwig Mies van der Rohe. The façade was composed of black painted steel framing members contrasted against white stucco first floor and warm brick second floor walls beneath a flat roof. Simple metal windows are juxtaposed with masonry brise-soliel that screen stairs. Cars are parked in ground-level bays adjacent to the stairs. The surrounding landscape was left largely undisturbed, with a sweeping lawn and original stone walls surviving intact. Mark-Rand Corporation next embarked on a four-story, 67-unit semi-luxury apartment building in 1964. Cornwallis Manor Apartments, located at 2200 West Cornwallis Drive, was built by Randall Sheppard for $750,000. The 360-foot long structure includes one and two-bedroom units that rented between $120 to $160 monthly. Amenities included heat and air-conditioning with individual controls, telephone, wall-to-wall carpet, kitchenette and breakfast room, sprayed acoustical ceilings, a master television antenna, and a private swimming pool. Adrian Stout was again the project architect for this Mark-Rand commission, which he addressed with a daring Mid-Century Modern motif. The Greensboro Record described the building as being of “contemporary design, with concrete structural frame and with the exterior of aluminum curtain wall panels and stair towers faced with field stone. It will be colorful, similar to some of the resort architecture in Florida and California.” The facade contrasts the machined Miesian curtain walls with hand-laid stone feature panels to differentiate interior common areas from private spaces. Parking was provided beneath the structure. 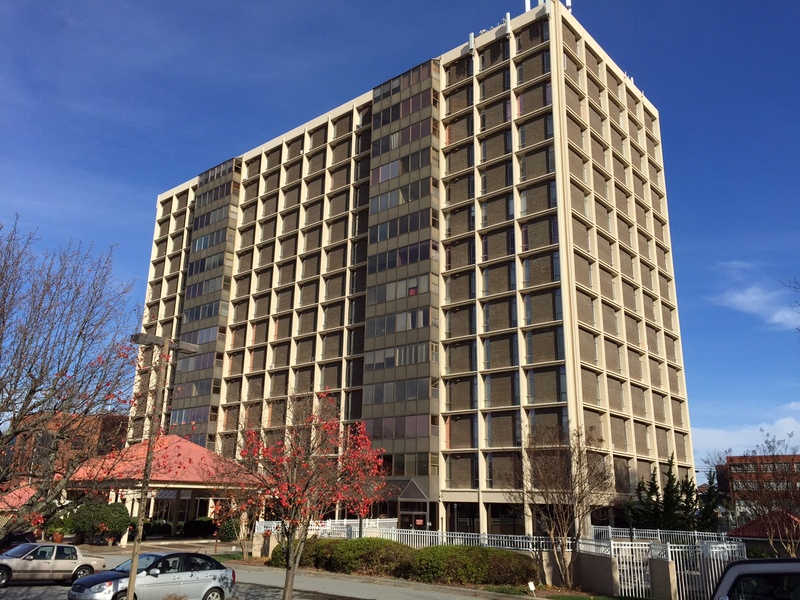 The Towers Apartments, located at 1101 North Elm Street, were announced by the Towers Holding Corporation of Charlotte in 1962. Harry Swimmer and Leon Greenberg were the principal officers of the corporation that commissioned Charlotte architects Conrad M. Tayler and Charles L. Bates, and Charlotte general contractor Little Construction. The $1,550,000, 14-story structure contained 104 luxury apartments in two-, and three-bedrooms plans. Amenities included heat and air-conditioning with individual thermostat, 10-foot floor-to-ceiling windows, kitchen disposals and dishwashers, walk-in closets, parquet floors, a master television antenna, and a private swimming pool. Rentals ranged from $225 to $270 per month. The strongly gridded façade features embedded panels flanked by windows. The entirety sits above an inset ground floor. Apartment units enjoy access to balconies that were aligned within two columns within elevations. The structure was innovative in its use of poured reinforced concrete. The tower represented an apex of modern luxury apartment living in the Gate City. The chronical of Greensboro’s multiple family housing is reflective of the city’s growing size and wealth. With greater population and capital, the city ventured into voguish national modes of apartment dwellings rarely seen in North Carolina. Today, Greensboro enjoys a full expression of apartment buildings ranging from the J. B. Crawford’s Vick Apartments, to Lorenzo Winslow’s Winborne Court, and Adrian Stout’s Cornwallis Manor. These treasured places continue to offer residents of Greensboro a diversity of housing options that delight the eye.